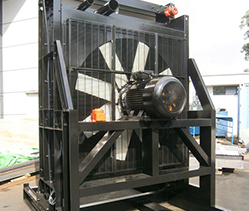 Vertical Remote Radiator | Perfex International Pte Ltd - Radiators, Charged Air Coolers, Heat Exchangers and Oil Coolers for power generation and other industries. This category of Radiators is useful when the Generator set requires the cooling system to be installed in a different location than the engine, hence the term Remote. The fan is mounted on the back end of the radiator and requires an additional electric motor to drive the fan. The design of this radiator is based on different application factors, such as noise constraint and physical outlook.